How can I set a keyboard shortcut to switch between Excel tabs? I find the Ctrl+ PgDn/PgUpnot good enough. When I have a lot of tabs it's very annoying to get to the right tab, or move it and change the order, which is sometimes important. I need Excel to switch between the current tab and the previous tab I worked with - regardless of their physical order. Just like windows Alt + Tab . I guess I can build a macro that remembers my last tab and assign a shortcut to it, but I would like to know if Excel already comes with that functionality. I don't believe Excel has a keyboard shortcut for toggling between sheets. 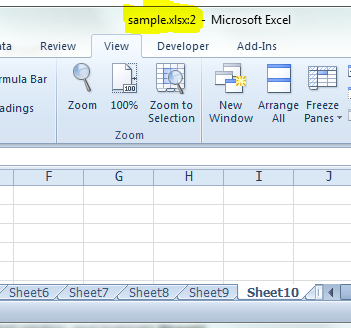 In Excel 2007 & 2010, as a non-VBA workaround, you can create a window for each sheet that you're working on. Let's say you were working on Sheet1 and Sheet10. Press ALT+Tab to go back to the first window, and highlight Sheet1. Note that the first window now has a :1 after the file name at the top. You can just use good old ALT+Tab to go back and forth between the two sheets. 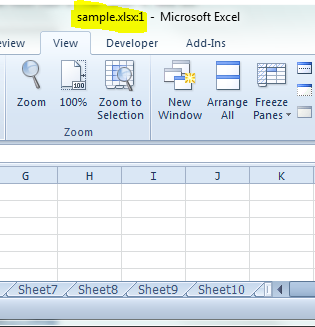 Note that you're not creating another instance of Excel, just a separate view for each sheet you need. So you can still add cell references, and pressing CTRL+S in either window updates the file. If you want to work on another sheet, either change the active worksheet on one of the windows, or spawn another one. Press "OK", and it will bring you to that sheet & cell. After you've done that once, you can simply double-click the recent links you've gone to, instead of typing in the whole link. Press Ctrl+Page Up or Ctrl+Page Down to navigate between worksheets in Excel. You can also right-click on the navigation arrows in the lower left-hand corner to display an Activate menu from which you can choose a worksheet. Now enjoy: Ctrl + G , type <> , hit Enter ..- excel will jump to the <> you have predifined , much faster than the Ctrl + PageDown , Ctrl + PgUp and much more intuitive in my opinion than the "New Window" approach. Not the answer you're looking for? Browse other questions tagged microsoft-excel keyboard-shortcuts tabs or ask your own question. In Opera 11, how can I set up shortcuts to switch to specific tabs? Is there a keyboard shortcut to circularly switch sheets in Excel? how to switch tabs back by keyboard in latest firefox (27)? Is it possible to assign a style to selected cells with a shortcut key in Excel 2010?